UV rays that can damage other types of conformal coatings and degrade transmission signals. Parylene is UV stable and holds a dielectric constant of 7,000 volts per mil at 25 micron thickness (Courtesy of NREL/National Renewable Energy Laboratory). All renewable energy systems rely on precision electronics to ensure they can deliver energy in a consistent manner. These electronics are subject to harsh use and hostile environments and need ­protection. One solution is Parylene protective coatings. Whether solar, wind, or any other renewable energy technology, electronics are the critical component to convert, invert, connect, transmit, track, regulate and monitor the system. The electronics are, however, often the weak spot in all systems. Take solar PV technology. 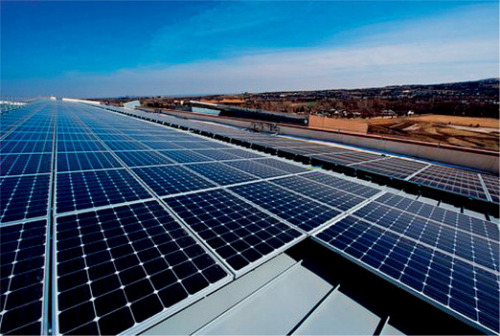 Currently solar panel/module systems carry a warranty of 25-30 years. Most inverter electronics need replacement in 10-15 years. In wind turbines failure of the electronics within the nacelles are the leading cause of downtime and repair expense for OEM's and wind farm operators. It's not that the industry is using less that the very best possible in electronic assemblies, components and boards. They are using top of the line and the latest in integral electronics for sensor, transmission and data analysis technology. The issue is that unlike consumer electronics or even the electronics within motor vehicles that see a harsh working environment, these electronics are installed in very hostile working environments and are expected to perform trouble-free for 30 years. Not many vehicles are expected to last that long nor consumer electronics which are quickly replaced by the latest and greatest. While there definitely are going to be upgrades as technology advances over the years, the goal should be to upgrade because it is wanted, not because of a failure that requires an emergency repair and replacement. The question is then, how to protect these densely populated and highly sophisticated electronics so ‘long-life’ becomes a reality. For many reasons, typical conformal coatings are not the answer. Alan Hardy, electronics market manager for Specialty Coatings Systems, based in Indianapolis in the US, notes most electronics in these applications can not be protected using standard conformal coating materials because they are too thick, too hard to apply, do not cover completely, add too much weight and do not provide a stable dielectric constant. For these reasons, Parylene has been used in military and aerospace applications for decades. It's now time renewable energy manufacturers look at this ultra-thin coating, he believes. The family of Parylene conformal coatings (N,C,D and Parylene HT®) has been trusted as rugged and reliable protection solutions for a wide range of aerospace applications for over 40 years. Parylenes provide “excellent ultra thin” barriers for moisture, chemical and biological agents, are RoHS compliant and have been proven to mitigate metallic whisker growth in lead-free solder applications. Hardy says Parylene coatings are typically applied in thicknesses ranging from 500 angstroms to 75 microns. “A 25 micron coating, for example, will have a dielectric strength of 7000 volts. No other conformal coating materials can be applied as thinly and uniformly as Parylene and still provide the same level of protection.” An added benefit of Parylene, he continues, is it can actually strengthen delicate wire bonds by an estimated factor of 10, “providing excellent durability where vibration is present” such as in wind turbines and energy harvesting systems. The polymerisation process and ultra-thin nature of Parylene enable it to conform to all surfaces, edges and crevices of a substrate, including the interior of multi-layer electronic packages and PCBs. This assures complete encapsulation of the substrate without blocking or bridging even the smallest openings. In addition, Parylene coatings are lightweight and do not add significant mass or dimension to delicate components. Wind turbines come in many sizes and configurations and are unique to each manufacturer. However, regardless of proprietary designs, basically all wind turbines contain up to 8000 parts, including gearboxes, power systems, generators, sensors and electronic control and power systems. These and other components are typically housed in the nacelle, which is mounted on the tower. They must be able to withstand and operate with constant vibration, temperature extremes, location environments (land or sea water), and limited accessibility (for maintenance). Taking this one step further, even monitoring on commercial and residential installations can benefit from Parylene protection, he contends. New smart meters monitor more than just solar or solar thermal performance usage data. These boxes are tapping into all areas of power usage within homes or commercial buildings. They are “set them, forget them” type installations that continually transmit data to the utility company and often the consumer too, depending on the type. They are invaluable – until they stop working correctly. Along with the more standard FR4 circuit board assemblies, Parylene is well suited for all flex circuit and rigid flex substrates. Even those using the latest in exotic materials are easily coated. Hardy says AdPro Plus® and AdPro Poly® from Specialty Coating Systems solve the adhesion challenges for difficult metallic, plastic and polyimide substrates without adding weight or changing the protective qualities of the Parylene coating itself. These enable Parylene conformal coatings to protect virtually every type of modern electronic assembly, he insists.